The interface between food intake, weight, eating behavior, and addiction has been a topic of increasing interest in recent years. For example, there was some consideration given to including obesity in the DSM-5, with proponents of such inclusion in part arguing for an addiction model. Twelve-step group approaches to earning disorder and obesity treatment have been tried, and in some areas are quite popular. Recently there has been increasing interest in the role of the concept of reward in disordered eating behavior; and much of this research is focused not only on the consumption food, but also on the consumption of drugs. Thus, the interface of food and addiction is currently quite topical. Still, discrepancies and significant uncertainties remain in this area. For example, there is real controversy about the idea that some foods could be addictive. In addition, the model of abstinence holds sway in the field of substance use, but such a model is not readily applicable to food intake. A new volume, Food and Addiction, a Comprehensive Handbook edited by Drs. Kelly D. Brownell and Mark S. Gold, is a very useful contribution to the literature in this area. The book covers a wide scope of topics related to this field. Sections examine the neurobiology of addiction, regulation of eating behaviors, and the interface of food intake and addiction. Thereafter, the clinical, public health, and legal implications of this literature are considered. The book contains contributions from leaders in the field. Coverage is concise, thoughtful, and authoritative. One particularly appealing aspect of the book is that the chapters are of very manageable length (66 chapters in about 450 pages). This affords the reader the ability to pick and choose topics of particular interest, which can be easily accessed; alternatively, the book taken as a whole provides a broad and thorough view of this area. 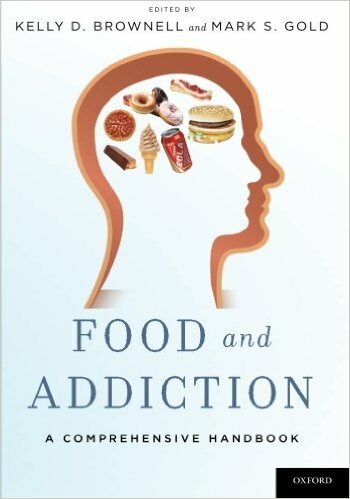 Regardless of whether or not one considers food intake to be an addictive behavior, the interface between addiction and food is one that arises frequently, and as such this book is of real value to the field.